controlling the visuals – searching for something? 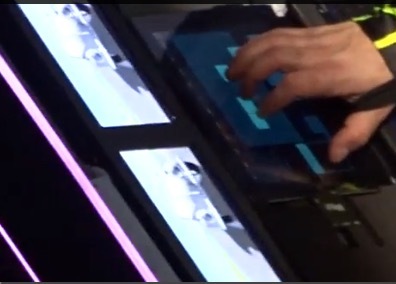 well – he’s going back to some control surface – possibly changed the scheme or preset – controlling visuals – I assume. Or just checking Emails? – ok he’s the video guy so it’s about visuals. „Ralf“ – playing melodies and vocoder chords aided by some screens. playing a Creamware Minimax , ASB Digital Synthesizer – check the Forum images to have a better view/more details. 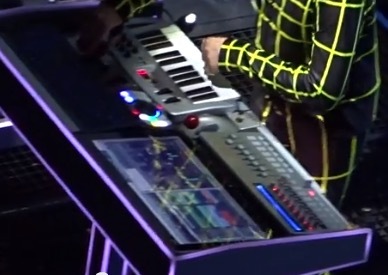 so it’s unique to see hardware synths again at their show. 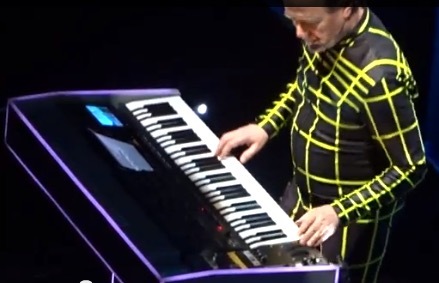 Since Kraftwerk were Odyssey users maybe it’s Oddity 2 vs. Korg Odyssey they might use — but seems like they– especially „the player“ Ralf has always been a Moog guy. 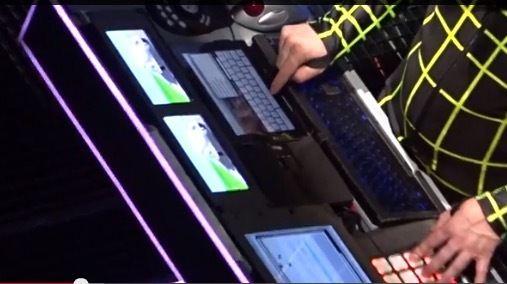 „Henning“ – simple controller, a Numark Orbit controller with accelerometer, Novation Remote SL Mk2 Zero and large screen. 2 special (possibly hand made) controllers – do I see the ribbon controller from doepfer here as well? 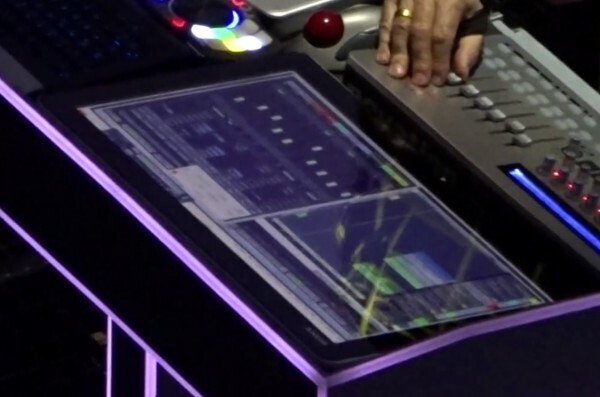 „Fritz“ – that tab is running Lemur for control stuff, NI Maschine (as a controller and pads for triggering samples) and some smaller stuff plus large touch screen and keyboard. and doepfer R2M ribbon controller. 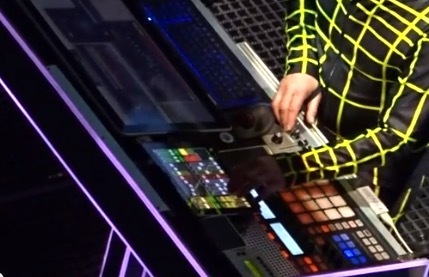 some special custom made faders and knobs (or do you know that controller)..
that software is … what? DSI 3 Octave Key Evolver!